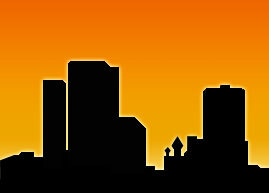 If you wish to jump straight ahead to the download section, please click this link. 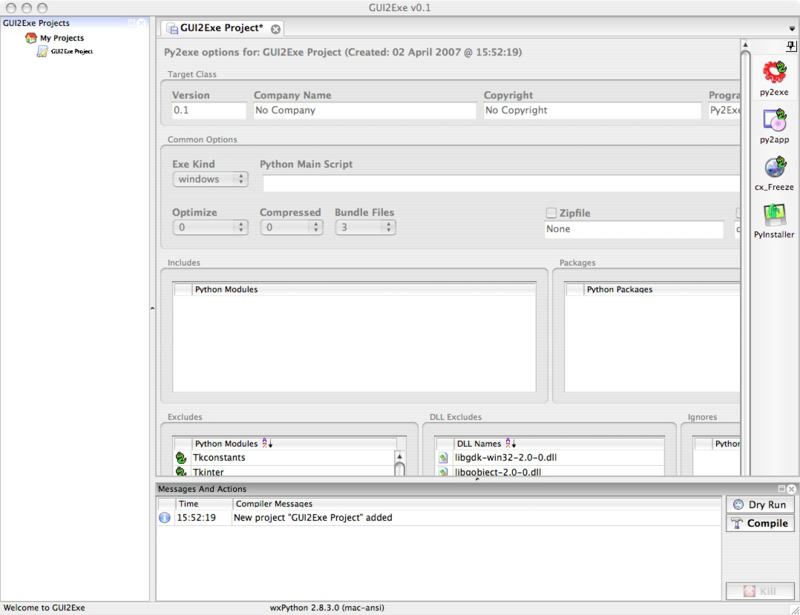 The aim of GUI2Exe was (for me) to create a wxPython GUI tool that unifies and simplifies various standalone executable builders for Python, such as py2exe, py2app, cx_Freeze, etc. It may look like the Holy Grail, but this is at least a step toward the Great Theory of Unification. The bottom window is a log window, that shows messages, warnings, errors and it contains 3 buttons: Dry-Run, Compile and Kill. The Dry-Run button is implemented only for py2exe. 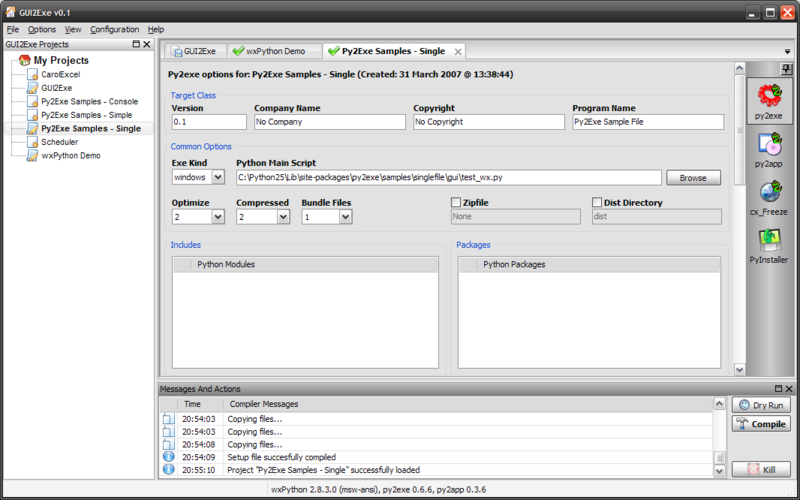 By clicking it, GUI2Exe will call py2exe but no real compilation will take place. The Compile button will actually build your executable, and the Kill button will attempt to kill a running building process. There are few caveats about the Dry-Run action, see below. The GUI2Exe "user guide" is still a work in progress: the documentation at the moment includes the epydoc-generated API for GUI2Exe. The code is quite well commented, but there is no user guide for GUI2Exe. See below for a couple of examples. There are few caveats about py2exe that I wasn't able to solve till now. You choose the Dry-Run option. 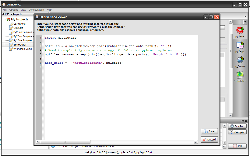 py2exe will crash with a system error saying that the file py2exe is looking for (YourScript.exe) can not be found. Yes, I knew that, it's a *Dry-Run*, so py2exe shouldn't look for any executable file. However, if you apply this patch to /site-packages/py2exe/build_exe.py, the problem should be fixed. On the 2 Windows PCs and on the Ubuntu Hardy Virtual Machine I tried GUI2Exe, , the interface looked reasonably good. I can't obviously test it on Mac. 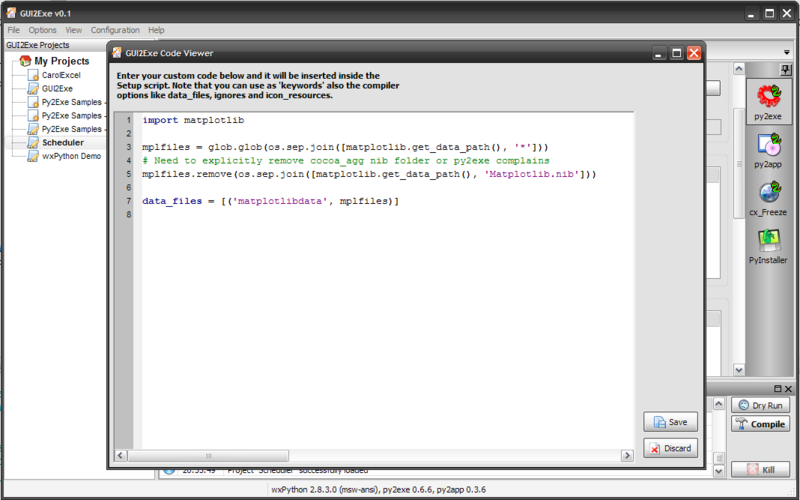 I don't know if the GUI will start on Mac, and if the code I wrote for py2app will work. 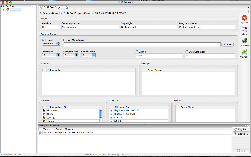 In any case, screenshots from other platforms (GTK and Mac) are always very welcome. 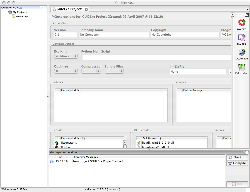 Hereafter I show a couple of examples on how to use GUI2Exe. And you're done. 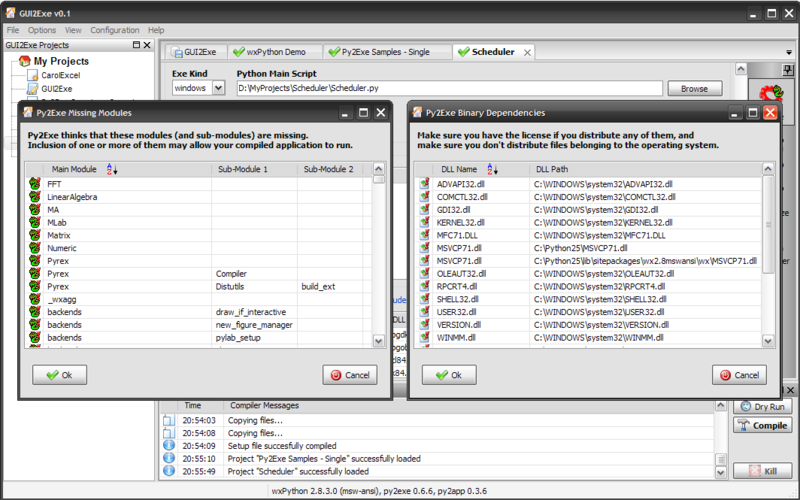 You can follow the compilation steps in the bottom log window as py2exe builds your executable. 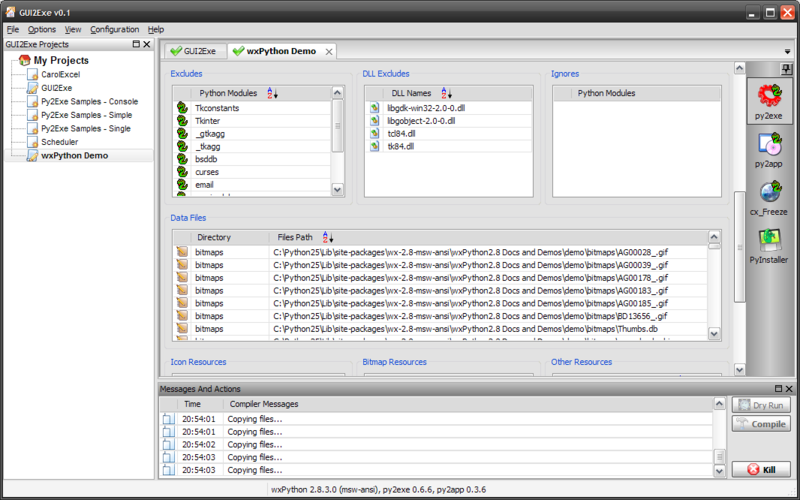 We will build the wxPython demo as executable, using py2exe. 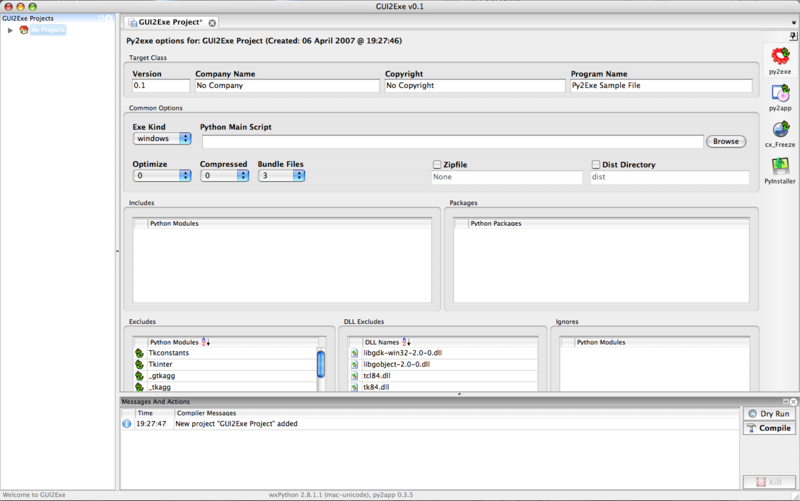 On the Data Files list, hit Ctrl+A, browse with the file dialog to /YourPathToTheDemo/demo/bitmaps and select all the files. 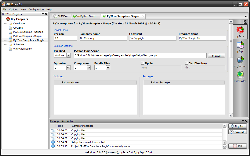 Do the same thing for the folders bmp_source and data.